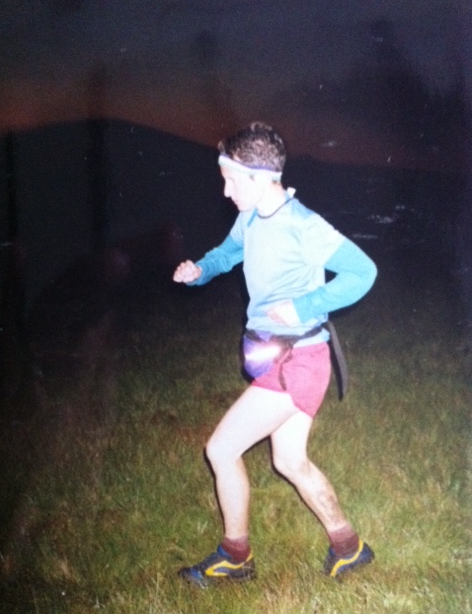 (I didn’t have the blog when I did this 24 hour challenge in 1999, but I thought it would be a good additional post!) 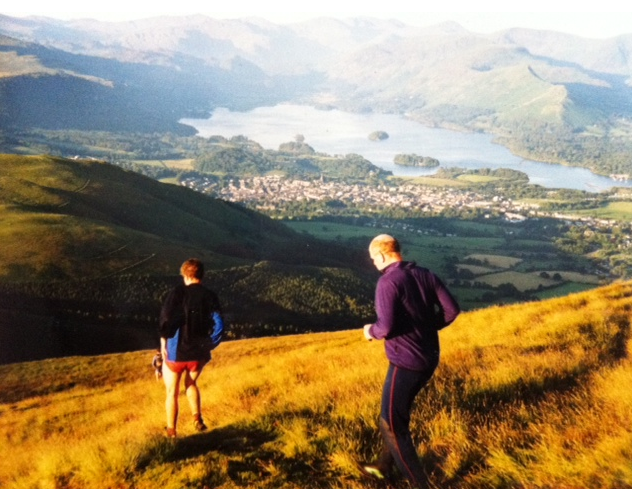 The route was first done in 1932 by (yes, you’ve guessed it, Bob Graham) and involves 42 Lake District peaks, 72 miles and 26,000 feet of ascent in under 24 hours. If you think about it, this means an average speed of just over three miles an hour, so you tend to walk the uphills and run the downs and the flats. It wasn’t repeated until 1960, but since then over 1700 people have done it. Over the previous year I had built up to running/walking 45 miles (i.e. 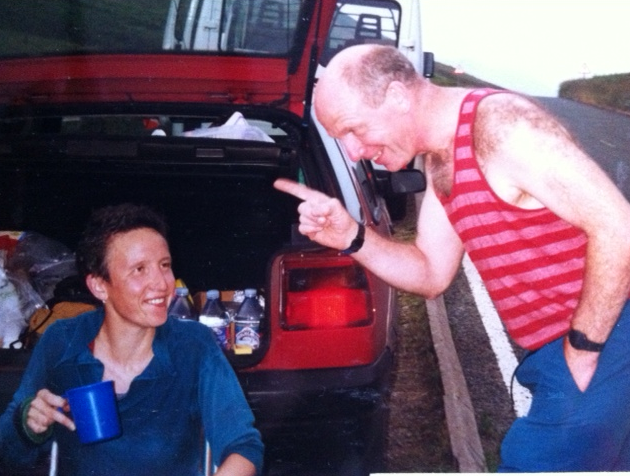 being on my feet for 10-15 hours) and had reccied all of the route at least twice, using my Dad’s house in Windermere as a base — and calling on his babysitting abilities while Dave ferried me to distant start points and accompanied me on runs (or more often went gear shopping in Keswick!). 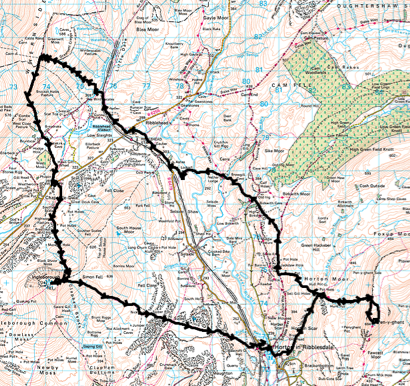 The route is divided into five sections where it crosses roads (HonisterPass, Wasdale Head, Dunmail Raise and Threlkeld) and at each of these points a different pair of ‘pacers’ take over to carry your food, fine tune the navigation and record your time on each summit. I’m lucky that my brother — who has done the BG in both summer and winter (fool) — could organise much of this, although John Duckworth and some other Derbyshire folks accompanied me on my first attempt and Dave Clough saw me briefly (!) on the second one. You can run either clockwise or anticlockwise and it’s best to set your start time so that you do the grassy Helvellyn ridge in the dark — this means a morning start going anticlockwise or an evening one if going clockwise, although having said that, a lot of people start at midnight and do Skiddaw in the dark. I shouldn’t really have started this as the weather was so foul and, sure enough, we lost a lot of time at night to atrocious visibility. I didn’t have the energy to start running again once the dawn broke, but I carried on a bit, hoping for a second wind. It never came, so we packed in at Rossett Pike, about half way round, and took the low route on to Wasdale. I don’t know if I’d have got round then, even in good weather, as I was recovering from a cold, had only trained to 30 miles, and felt pretty bad for missing a night’s sleep so early on in the run … a new strategy was required — an anticlockwise attempt. A walking holiday in Ireland plus doing the Saunders Lakeland Mountain Marathon with Dave got me in good shape for this. You have to do a write up for your run to count officially, so here it is. I opened the curtains on Saturday morning gutted to see mist of the consistency that had thwarted my previous BG attempt six weeks ago, and even considered postponing things on the drive to Keswick. Good thing husband/road manager Dave talked me out of it! 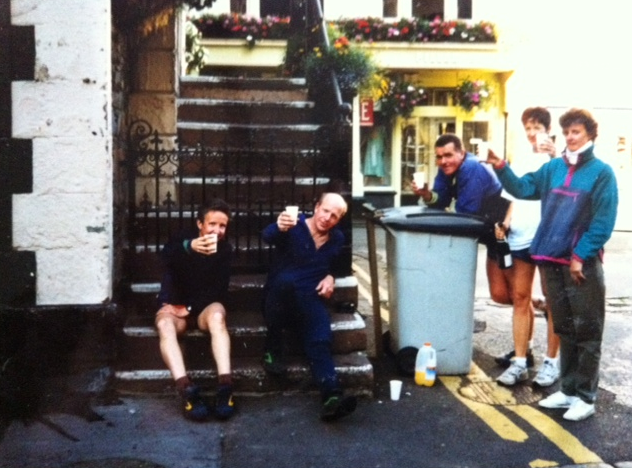 Joined pacers Tony Walker and George Robertson at the Moot Hall and set off at 7.30 through the mizzle to Low High Snab, reaching the summit of Robinson in 90 mins. The mist was thinner on the tops, so navigation wasn’t a problem (yet!). One of the main roles for pacers on this section is to slow you down, but I’m glad Tony and George didn’t do this. At Honister, Mark Flemming and dog Maggie took over. After Mark’s canny route off Great Gable, where I was thoroughly disoriented, we were on schedule to Pillar but started looking for Steeple too early — before hitting the wall on Scoat Fell — so lost 15 mins, but apart from that, Maggie had a pretty good nose for the path when she wasn’t too busy chasing her tail! Was cheered to see Hilda on her clockwise BG at Steeple and still on schedule. Good scree run off Yewbarrow — better than stumbling through bracken covered boulder fields, as on my previous recce. At Wasdale was met by Dave Clough from our orienteering club who’d walked over from Honister having just missed me. 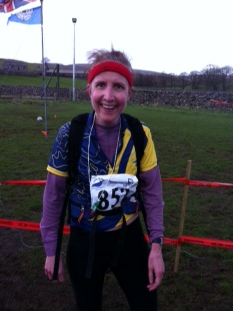 Had some of Kate’s chicken stew and a Dioralyte to rehydrate, plus mandatory tea and Isostar. Seeing Fred Rogerson there made the BG attempt somehow seem more real. 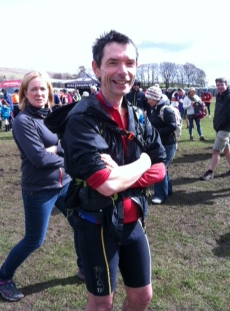 Then new pacers Brian and Susan Clough for the Big Bad Central Section. On the way up Sea Fell took an impromptu decision to descend via Lord’s Rake rather than Fox’s Tarn and this saved a lot of time as it was only 31 mins summit-to-summit. Saw some of the Wasdale racers on Sea Fell Pike — great atmosphere up there; the pacers seem to know everyone we pass, like it’s their local high street. Brian and Susan had some canny routes and a seemingly endless supply of jelly babies, which saw me through my only bad patch. 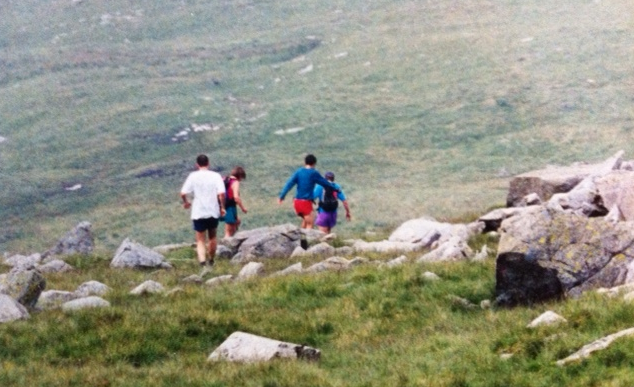 I remember saying to Brian when we were descending Bowfell that Rossett looked like the Eiger, but we were there in a jiffy, having coffee and Battenburg with Munro Bagging chums Sue, John and Martin. They said they’d seen me looking worse, but only after a night in the pub! The mist had cleared now and John Cann joined us to Dunmail, where he arrived in his white T-shirt, looking more like a Persil advert than a fell runner! The crowd put on a great welcome and I had some more stew and Dioralyte by the dual carriageway. The last three sections had taken 12 hours 50 mins, exactly to schedule. It was a good feeling setting off up Raise Beck with BG guru Eric Draper and husband Dave, knowing that I had 11 hours to get back to Keswick and plenty of daylight to get off Fairfield. Eric found the gully down and we were soon zigzagging up Dollywaggon. 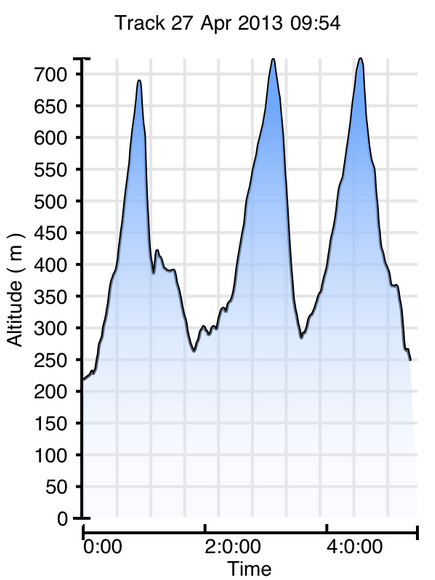 Helvellyn was reached, 30 minutes up on the schedule. The wind was starting to pick up now but there was no mist and the grassy whalebacks of the Dodds were soon traversed. However, the 30 minutes were soon lost in the farmland at the bottom of Clough Head where we plodded through endless tussock of reeds with a few stone walls for good measure. Boy, was I relieved when I heard Eric say he was on the road. Met brother and BG veteran John Brockbank at Threlkeld where I scoffed some egg butties and set off up Halls Fell Ridge, Eric continuing on this section too. Torches off at the top and jogged down Mungrisdale Common to a technicolour dawn (which, having caught on camera, John proceeded to fall into a bog and submerge said camera), and ice-cold Caldew and that endless fence up Calva. I was slowing on this last section, and it was a good job it wasn’t any longer or I wouldn’t have made it. On the top of Skiddaw we met Dave in an icy wind and jogged down to crystal clear views of the whole of the Lake District rippling out in front of us. 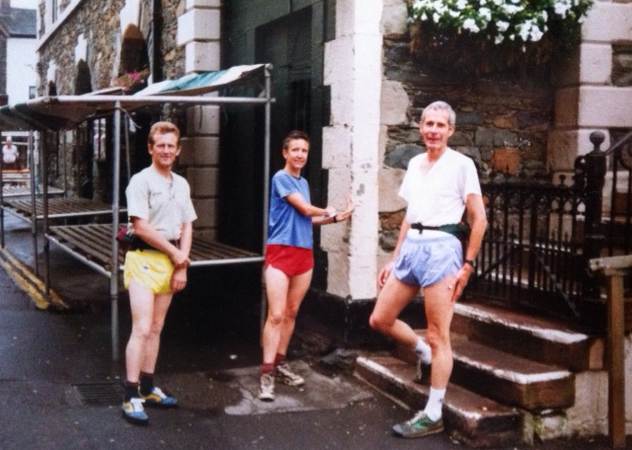 Met Caroline and Kate (Eric and John’s partners) on the way into Keswick and arrived — incredibly happy — at the Moot Hall at 7.03 where there were hugs and Bucks Fizz. Thanks go to all the pacers for their excellent company (and those that paced six weeks previously); to training partners in Derbyshire and the Lakes; to John for inspiring me, showing me the routes and rallying the support for both attempts; to Dave for believing that I could do it, not letting me give up when winter training was getting me down (this tended to involve taking me to the pub) and miles of driving over Lakeland passes; and to my Dad and Dave’s family who spent many a weekend looking after Zoe while “Mummy ran up the mountains”.